Chris Athens is a senior mastering engineer at Sterling Sound, one of the world’s premier mastering facilities. Chris has mastered albums for Rick Ross, Wiz Khalifa, Nas & Damien Marley, Ciara, Pitbull, Coldplay, Erykah Badu, Weerd Science, Ben Folds Five, and many others. Mastering is a crucial process, but it's not always all that well understood by the average musician…so let's deal with some of the basic issues. The article title alone is enough to cause some professional mastering engineers to run to various forums and start complaining. "That's what's wrong with this industry, these kids don't know how to master, you gotta have a professional do it, blah blah blah." It's a dirty job to go from high-res audio to 44/16, but someone's got to do it. Bob Ludwig, Doug Sax, Bernie Grundman - they're masters of mastering. They produce hit after hit, with nothing at their disposal other than...well, experience, talent, great ears, the right gear, and superb acoustics. 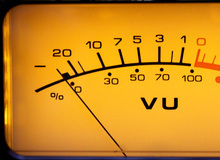 Mastering is one of the few creative processes that still finds itself quite high up on a pro-audio pedestal. The creation of music, the recording, mixing and production is all within the hands of the home user but mastering still seems to be just out of reach...Or is it?